The Participant Observer Recipe of the Month is for Persian Baghali Polow ba Mahicheh. A savory lamb-based dish enjoyed at Persian celebrations. While it takes a bit of time and care to cook right, the results are spectacular! Rice occupies an important place in modern Persian cooking. Bread may be the main staple of most Iranian peoples, but rice is where the majesty of Persian cooking is expressed. For some peoples, notably those in the Caspian region, rice plays a part in the everyday meal. Well-irrigated farmland allows regions like Gilan and Mazandaran to produce various cultivars of indica (long-grained and perfumed) rice. Rice dishes such as tachin (baked rice) and polow (steamed, layered rice) are central to many celebrations. Other dishes, particularly sabzi polow ba mahi (herbed rice with fish), are enjoyed at feasts for Persian New Year (Nowruz). Polow is the Persian version of pilaf. According to the Oxford English Dictionary, the word pilaf entered the English language from Turkish and Farsi (the language of Persian people). The older words pulaw (Farsi) and pilav (Turkish) are both linguistic ancestors of pilaf (USA) and its variant pilau (UK). A pilaf is essentially a rice dish cooked in stock with some combination of vegetables, fruits and meats. The rice is cooked in a manner that prevents it from sticking together. The origins of this cooking method are uncertain. Although there are descriptions of pilaf preparation in the 10th-century works of Avicenna, the great Persian thinker of the Islamic Golden Age, the modern version of polow seems to have emerged during the Safavid Empire of the 16th century. Polow spread with Persian peoples and influence around Central Asia, the Indian subcontinent and eventually to Europe. It is a dish that combines multiple elements of a meal in one luxurious dish. 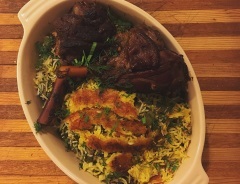 The dish below, baghali polow ba mahicheh, is a very popular dish that employs two major Persian culinary techniques: steaming rice and braising. Baghali translates to "fava bean" and that, along with fresh dill, defines the rice portion of the dish. 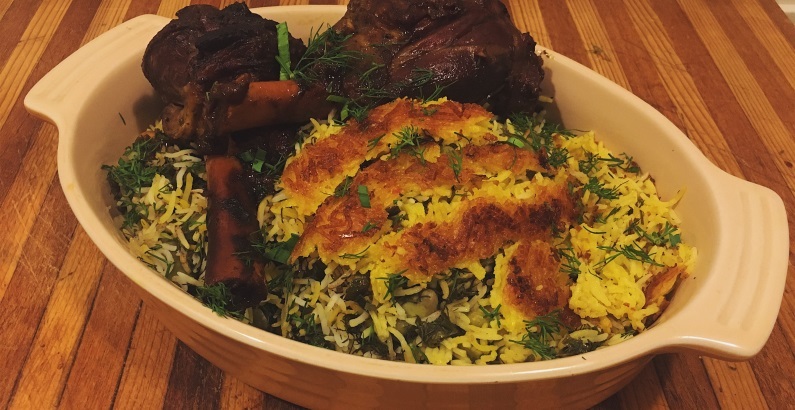 Braised lamb shanks, (mahicheh in Farsi), round out the dish, developing a deep richness and a velvety texture due to the breakdown of the collagen in the meat. One of the most important aspects of every polow that cannot be overlooked is tahdig. Tahdig is the crusty, seasoned rice layer at the bottom of the pot of polow. It can be made in a variety of ways with a variety of ingredients. Lavash, potato and rice contribute texture and crunch, while milk, yogurt, oil and egg are often mixed with saffron to season the tahdig. Tahdig presents a unique challenge for cooks and I highly recommend using a nonstick pot to get a proper crust and to avoid having to scrape off the tenacious residue that will form on the bottom of the pot. Persian rice varieties, to my knowledge, are not available at the Middle Eastern and Iranian markets around town, so basmati rice is the next best thing. You want to get khaki-colored rice that is fragrant when dry. Most brands are of good quality. I used the Baghlan Brand, which worked out well in this recipe. When selecting saffron, I recommend purchasing it at a Middle Eastern grocery such as Balboa International Market in Kearny Mesa, as the saffron found there is often produced in Iran. Advieh, a spice mixture mentioned below, can be made at home or purchased at markets such as Balboa, Harvest, North Park Produce, Ariana Produce and others. 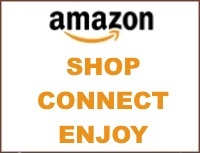 Fava beans are readily found at most of these stores. A final note: high-quality honey and lamb are advised for the mahicheh. Combine first four lamb ingredients in a bowl and evenly coat the shanks with the mixture. Set aside and preheat the oven to 325° Fahrenheit. Heat the oil in a large dutch oven (one that will hold the lamb shanks) over medium-high. Sear the shanks on all sides without burning the flour. Remove shanks from Dutch oven and wipe out any burnt flour (this will make the rest of the braise taste acrid). Add fresh oil if needed and heat over medium. Add onions and garlic to the pan and sweat until softened. Combine the honey, lime juice, citrus zest, advieh and saffron water mixture in a bowl and mix thoroughly. Add this to the softened onions and garlic and cook gently for 1 minute. Add the lamb shanks back to the pot, nestling them into the onions, and add water to cover the shanks about ¾ of the way. Lid the pot and place it in the oven for about 3 hours, or until lamb is tender. Gently wash the basmati rice in warm water. Rinse the rice in a bowl or pot and gently agitate with your fingers. Drain the rice of all water using a fine colander or sieve. Repeat 5 times. In a small pot of boiling water, add turmeric, 1 tablespoon salt and the shelled fava beans and blanch for 1 minute. Allow the fava beans to cool and remove the outer, pale shell, revealing the emerald green bean beneath. Set aside. In a 5-quart nonstick pot, bring 10 cups water and 4 tablespoons salt to a boil and add washed rice. Boil rice for 5-7 minutes, or until the grains elongate and soften. Drain the rice and rinse with cool water to halt cooking and remove any excess starch. In a large mixing bowl, combine ½ cup neutral oil, the yogurt, 1/2 teaspoon saffron rose water, and 2-3 cups rice. Stir gently and spread the mixture over the bottom of the non-stick pot. This is the tahdig layer. Combine the rice with the fava beans and spread a layer over the rice-yogurt mixture. Follow that with a layer of dill, tareh, cardamom and cinnamon. Repeat this, forming a conical shape, until all ingredients are in the pot. Cover the pot and cook over medium-high heat for about 10 minutes. Mix the remaining oil, ¼ cup water and saffron/rosewater mixture in a small bowl. Remove the lid of the pot and, using the handle of a wooden spoon, poke 5-6 holes into the rice in a circular pattern. Pour the oil/water/saffron mixture over the rice. Wrap the lid of the pot with a clean dish towel (nothing that smells of detergent or other food as this will affect the rice) or sturdy paper towels and replace the lid. This prevents steam from escaping and water from falling back into the rice. Steam the rice for about 30-45 minutes over low heat. The rice should be tender and aromatic, so check after 30 minutes to see if it's done. When cooked, remove the rice with a serving spoon and place on a platter or large plate. Arrange the lamb and pieces of tahdig (which can be removed with a wooden spoon) around the rice and serve.